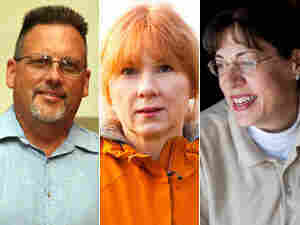 Voluntarily Uninsured: A 'Calculated Risk' Lyn Robinson, 52, is a small-business owner. She says paying health care costs out of pocket leaves her better off than paying for expensive insurance that might not even give her the coverage she wants. Lyn Robinson owns Zenith Holland Gardens, a wholesale plant nursery. She chooses not to buy insurance and says she likes deciding where and when to spend her medical dollars. Nearly 46 million people in America are without health insurance. But by some estimates, as many as one-third of them are what you might call "voluntarily uninsured." These are people who could afford coverage but don't buy it. Lyn Robinson is one of them. 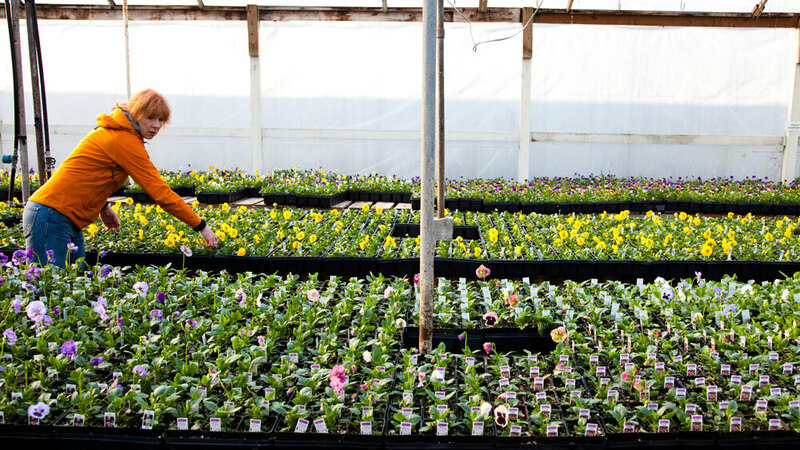 She's the owner of Zenith Holland Gardens, a wholesale plant nursery in Des Moines, Wash.
"As a small business owner, sometimes it's hard to pay the bills every month," the athletic 52-year-old says regarding why she doesn't have health insurance. She's driving to an appointment with her chiropractor, which she pays for out of pocket. "Most months I can do that, but every couple of years I'll run into a dry spell where maybe for three or four months it's a struggle, and things like health insurance, medical premiums, I'm not going to be able to pay," Robinson says. Robinson estimates that health insurance would cost her about $500 a month. That's a lot of money for a policy that might not even cover the kind of preventive care she values. As she drives down the interstate, Robinson explains that she's a big believer in alternative medicine. She regularly visits not only a chiropractor, but also a naturopath, an acupuncturist and a massage therapist. "I'd rather use the $6,000 a year that I would pay in health insurance premiums and put it toward actual care — pay the doctor directly," she says. On this particular day, Robinson is going to the chiropractor for a variety of aches and pains related to her active lifestyle. This summer she sprained her ankle on a 10-day backpacking trip. She also has a cracked rib from inner-tubing with her grandson behind a powerboat. At the chiropractor's office, Greg Summers gets right to work on Robinson's rib. It sounds awfully painful. She cries out as he manipulates her torso. Several manipulations later, Summers is finished and Robinsons says, despite her painful yelp, she feels good. "At that moment it hurts, but always afterward it feels better," she says. Robinson pays her bill, which is $35 a visit. She says another reason she's uninsured is she doesn't particularly trust insurance companies. She thinks they interfere in the relationship between patient and doctor — driving up administrative costs and deciding what is and isn't covered. Robinson likes the power of deciding where and when to spend her medical dollars. Just like when she climbs mountains and goes snowboarding, she says, not being insured is taking a calculated risk. "I'm sure that there's people out there that are going to say that's crazy and irresponsible," Robinson says. "Maybe it is, maybe it isn't. Maybe we're just brainwashed into believing that we are supposed to have insurance to be fiscally responsible." It's not as though Robinson's philosophy about health insurance hasn't been tested. Nearly a decade ago she fell while Rollerblading and badly broke her wrist. She had to have two surgeries. The whole ordeal cost her $14,000 out of pocket. You might think an experience like that would have shaken Robinson's belief that she can go through life without the blanket of protection that insurance affords. In fact, she says it had just the opposite effect. "If I have one of those kinds of incidents once in 10 years, I can pay the bill because I haven't paid worthless insurance premiums, I haven't paid out $6,000 a year for the false security that somebody's going to take care of me if something happens," Robinson explains. Self-reliant as she is, Robinson admits that in a perfect world she'd like insurance — if it was affordable and if the plan was tailored to her. She says she doesn't want to subsidize people who live unhealthy lives, and she doesn't want to pay the same premiums as the average 50-something woman. "If they could factor in my health — like, I could be rewarded for the fact that I have low blood pressure, low cholesterol, low body fat, low resting heart rate, I should benefit from that," Robinson argues. "Those that don't have that maybe pay a little more. But maybe I pay a little more because I ski and snowboard." Robinson says participating in this story has made her give a lot of thought to being uninsured. And it's rattled her a bit. If she got really sick or hurt and racked up hundreds of thousands of dollars in medical bills, she could lose her business. For that reason, Robinson says, she has started shopping around for lower-cost catastrophic coverage — just in case.